There’s nothing quite like the beauty and functionality of a well-designed tool. The Swedish hand bobbin winder is one of those tools. A bobbin winder is essential. Steve made a superb electric bobbin winder for me that I normally use. But at our Texas hill country home, my Swedish bobbin winder comes into play. And it is a pleasure to use. 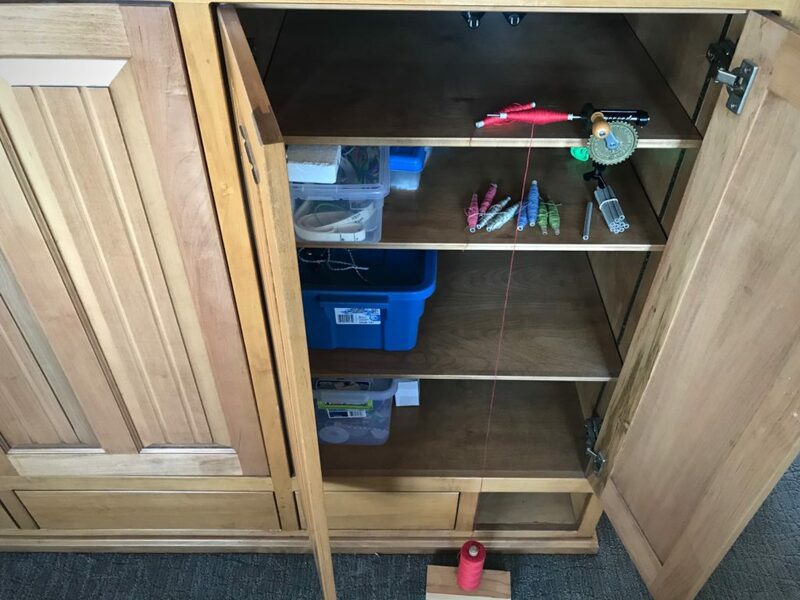 I clamp the bobbin winder on a shelf in the cabinet where I store my few weaving supplies for this location. The tube of thread sits directly below on a simple homemade spool holder. 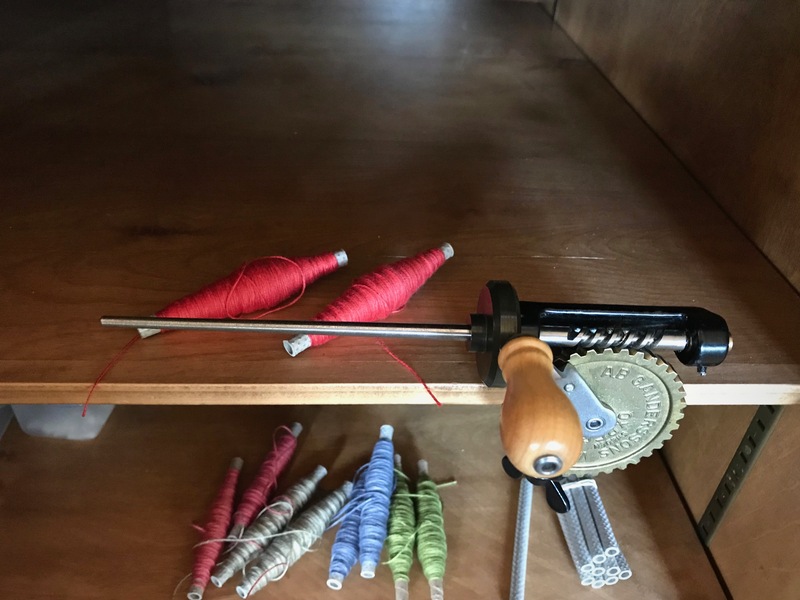 Swedish hand bobbin winder is set up in my supply cabinet. It is easy to remove and put away when I finish winding quills. Narrow spindle on the bobbin winder is the size that works for winding quills. For these color-and-weave cotton placemats, I am using double-bobbin shuttles. So, with the impressively simple Swedish hand bobbin winder I am winding matching pairs of colorful 8/2 cotton quills. 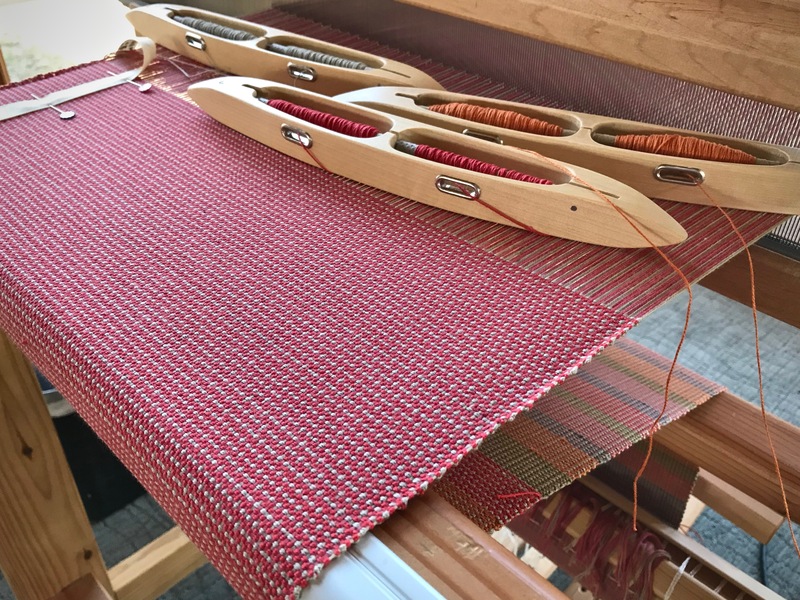 Double bobbin shuttles are handy for weaving this doubled weft color-and-weave pattern. May you have the pleasure of working with well-designed tools. I am glad I found your blog. It visually explains how weaving should look when done right. AND—– (very important) has been kept up to date since 2013. Hi Nannette, What a kind thing for you to say! I aim to give visual explanations, so I’m happy to hear that from you. Yes, I have been posting twice a week ever since I started in April 2013. Thank you for noticing!